Adelman’s endorsement and that of the big dog on the block, Colin Powell, both emphasized the larger question of the qualities of the two men running for President over policy specifics. Adelman even allowed that he disagreed with Obama more than McCain on a point by point basis, but that he nonetheless will vote for Obama “primarily for two reasons, those of temperament and of judgment” — as evidenced by McCain’s erratic lurching during the onset of the financial meltdown and his choice of Sarah Palin respectively. Those are reasons a national security voter would seize upon, and I agree that they are, or ought to be, sufficient to secure Obama an unprecedented unanimous vote next Tuesday. But it occurs to me that in my discussions of McCain’s disqualifications for the office he seeks from the point of view of what would be best for American science, I’ve tended to focus on process, on political nuts and bolts, to the partial exclusion of the kind of overarching “quality of his mind” arguments that the Powell and Adelman endorsements emphasized. See especially this post for what I mean, this, and this besides if you are a glutton for punishment. So it’s a fact that in all likelihood McCain will gut science spending, and pick winners and loser for reasons outside the judgment of professionals as to the promising areas of pursuit (think of it as executive department earmarks) is amply supported by the evidence. But the deeper danger for US science research and education that a McCain and Palin adminstration lies with their catastrophic failure to understand what is required to do science in the first place. They lack the understanding, the breadth of knowledge and experience, the judgment to be stewards of the single national endeavour that matters most to our longterm security and prosperity. Why do I say so? Because that conclusion seems to me by far the most reasonable interpretation of the statements made by Sen. McCain and Governor Palin, both recently and over much longer time frames. These statements are by now familiar to most folks likely to be reading this blog, so I won’t go into my usual logorrhea here. But the highlights bear remembering. Kidding she wasn’t; celebratory in her ignorance she was. Not to belabor the point, but if you like the prospects of modern gene-centered research in particular and molecular biology in general, you have to do a ton of research just like the two maligned projects. Elect Palin and McCain if you want put perhaps the single most fruitful research area in all of current science into the category of things you laugh at because they sound wierd. This is a case where the two candidates demonstrate that they lack ability to understand and interpret the connections between particulars and the bigger picture. I can’t think of a worse attribute in potential Presidents. Then there is the ability to hold contradictory ideas in one’s head without noticing. There are too many examples of this to list. Some of them, I think, merely expedient willed ignorance — think of McCain’s hopelessly impossible budget proposals, with its freeze that isn’t a freeze, a promised end to the AMT, renewed tax cuts for the wealthiest, increases in military spending, stimulus and financial bailout to add to the half-trillion dollar current deficit and a promise to balance the budget in four or eight, or four, or eight years or wherever Douglas Holz-Eakin has left his abacus rightnow. But others are either truly cynical — lies told to gain political power, again, not a qualification for the office such behavior is intended to secure — or signs of real intellectual blindness. A simple and obvious case is McCain’s attempt to suggest that he is at once serious about controlling climate disruption and increasing fossil fuel use — see e.g. the gas tax holiday, still promised on his website, and drill, baby drill. The two categories are incompatible. You can’t control human impacts on climate unless you create incentives to cut carbon use — that is to say, make the price of fossil fuels go up. McCain has said he supports a cap-and-trade mechanism to do just that (though one of the posts linked above describes just how hollow a promise that is), but such a mechanism is meaningless in the face of determination to expand the availability and drop the price of fossil fuels. You can’t do one and have the other. And promoting such policies, as McCain did just today in Florida, means, just to repeat it, that he is either lying when he promises one outcome or the other, or he simply cannot process the fact that the two policy goals are incompatible. You choose which explanation you like. It doesn’t matter. No such person can be trusted to make sensible decisions about the future of science (or much else for that matter) for the United States. Again: the point I am trying to make is not that McCain and Palin have articulated bad policies for American science, though they have, but that the way they think, their poor judgment about technical and scientific matters, their lack of capacity to grasp how the actual daily work of science proceeds matter more. Their willingness to ridicule specific bits of research they don’t understand exacerbates the problem by diminishing the value our culture as whole places on inquiry and discovery. The bottom line: a President McCain or, should the plausible succession occur, a President Palin, do not possess the qualities required to nurture the future of American science. Their ascendancy would rob the enterprise of both the hard cash and the oxygen of cultural approbation it needs to survive. On the other hand, if you care about the ability of the United States to retain its narrowing pre-eminence in scientific and technical research, you would do far, far better to vote for Senator Barack Obama and his Vice Presidential partner, Senator Joseph Biden. *I don’t mean to say that Governor Palin wasn’t ridiculed for her fruit fly idiocy. It’s just that she wasn’t derided enough. 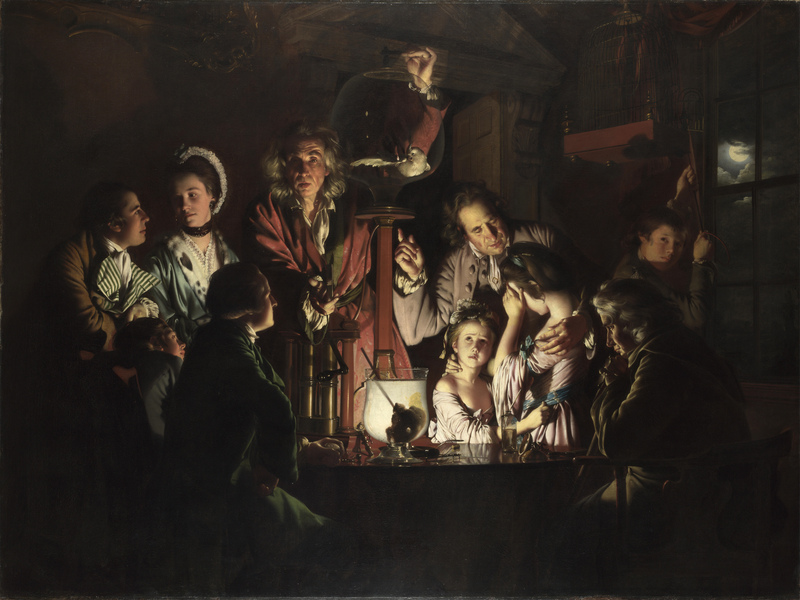 Image: Joseph Wright, “An Experiment on a Bird in an Air Pump,” 1768. Source: The Yorck Project: 10.000 Meisterwerke der Malerei. DVD-ROM, 2002. ISBN 3936122202. Categories: bad ideas, Biden, McCain, Obama, Palin, Politics, Science Policy, Stupidity, Who needs science? No Comment Needed: Sarah Palin/National Security Dept. So, the Bush Administration actually does the conventional, correct thing this week and calls up the major candidates for national office to brief them on the ongoing Status-of Forces negotiations with Iraq. So Senator McCain got a call. Senator Obama got a call. Senator Biden get a call. Link on over to Think Progress for the ensuing hilarity. 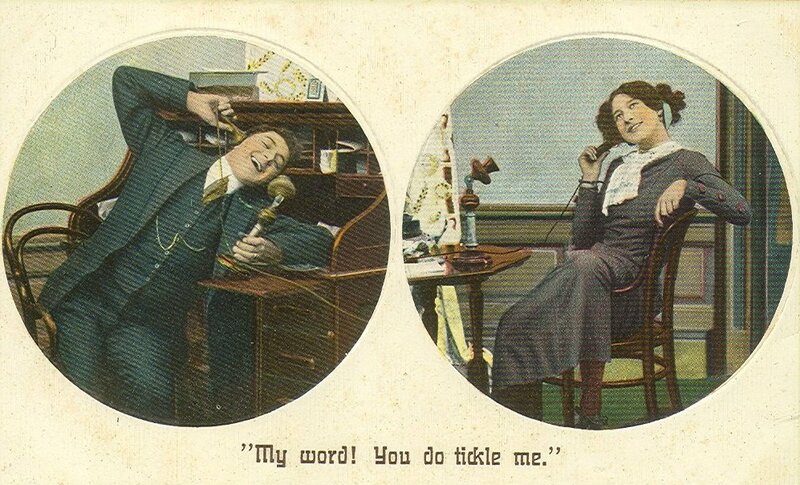 Image: Postcard, 1910. Source: Wikimedia Commons. Categories: Biden, McCain, Obama, Palin, political follies, Politics, Stupidity, War, Who thought that was a good idea?